After waking up from hibernation, Bear is starved. 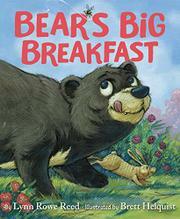 Breakfast is in order, but the perplexed ursine cannot put a paw on exactly what it should be; it starts with the letter B…. It can’t be friend Bunny, who informs Bear, “I am too skinny to taste good” but will help with the search. The pair set off and meet up with Bumblebee. Before Bear can get any ideas, Bumblebee stings it on the nose, and Bear quickly decides to keep looking, now with the insect’s help as well. Now there are three on the breakfast search. Bit by bit the search party grows as they encounter Boa (who offers some bark), a bat (who is too bony for bears), and Bluebird (who needs to take care of her beautiful babies). Eventually, in a nail-biting sequence over three double-page spreads, they spot a brown-skinned child. Could it possibly be that this is the “B!” Bear is looking for? Children are clearly meant to see a boy here and supply the story's punch line, but the word "Boy" is never printed on the page. Readers will be relieved to find it’s the “Berries!! !” the child has been gathering. The story ends with everyone, child included, taking a nap after a bountiful breakfast of berries. Helquist’s charming acrylic-and-oil illustrations are very expressive, anthropomorphizing the animals just enough to engage but making sure Bear’s canines are evident at all times. The spread in which the animals wonder anxiously if they have finally found Bear’s “B!” is priceless.